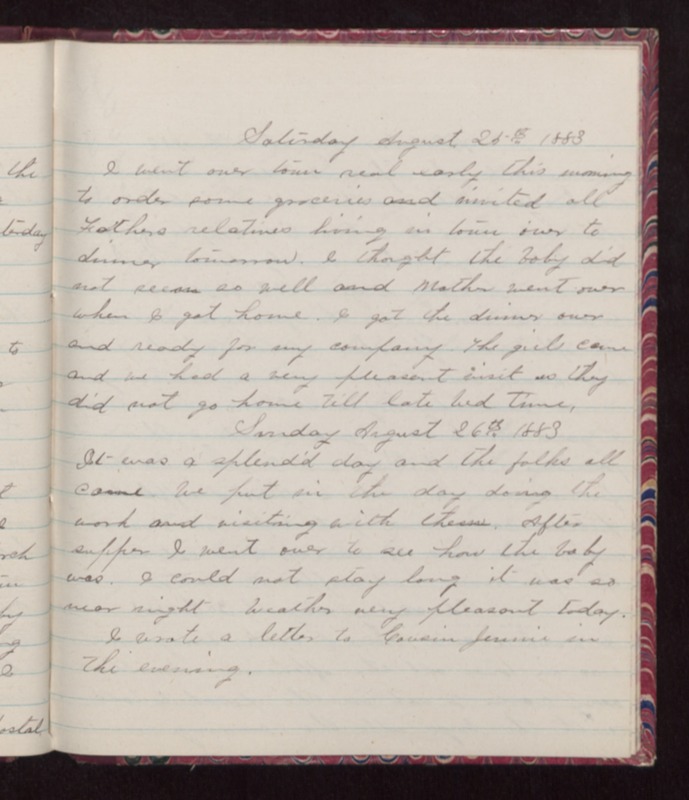 Saturday August 25th 1883 I went over town real early this morning to order some groceries and invited all Fathers relatives living in town over to dinner tomorrow. I thought the baby did not seem so well and Mother went over when I got home. I got the dinner over and ready for my company. The girls came and we had a very pleasant visit so they did not go home till late bed time. Sunday August 26th 1883 It was a splendid day and the folks all came. We put in the day doing the work and visiting with them. After supper I went over to see how the baby was. I could not stay long it was so near night. Weather very pleasant today. I wrote a letter to Cousin Jennie in the evening.